A 23 year old malt whisky, distilled in 1973 and aged in oak for the next 23 years. Bottled in 1996 at its natural cask strength of 59.7% abv. 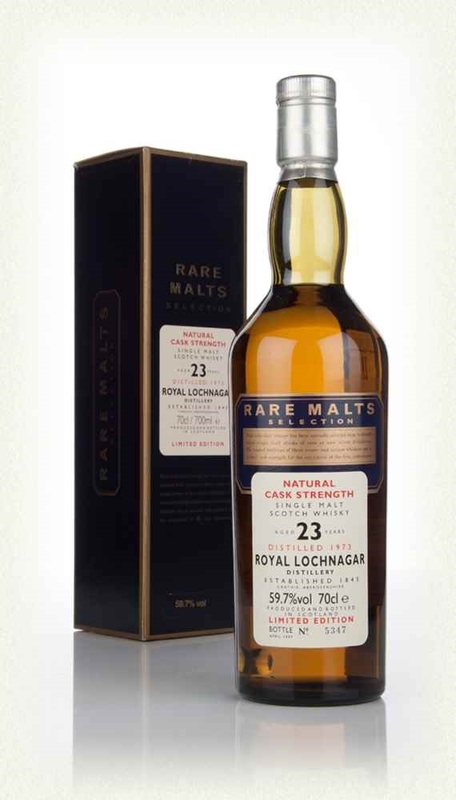 Royal Lochnagar 23 Year Old Rare Malt Whisky was distilled in 1973 before undergoing careful ageing in oak cask for the next 23 years. In 1996 it was bottled at its natural cask strength of 59.7% abv. Royal Lochnagar is one of the few distilleries in Scotland to have been granted a Royal Warrant and its Rare Malts range is highly prized by whisky connoisseurs the world over. Located on Deeside close to Balmoral Castle the Royal Lochnagar distillery was originally founded in 1826 although the site of the current distillery dates from 1845 since when it has been in almost continuous use other than brief interludes in 1860 and also during the Second World War. Queen Victoria made her first visit to Balmoral in 1864 taking the opportunity to visit Royal Lochnagar and awarding a Royal Warrant that very same year. It was family owned until 1916 when it was sold to John Dewar & Sons and subsequently sold again in 1930 when it was purchased by Diageo. Royal Lochnagar has the sixth smallest production amongst whisky distilleries in Scotland. 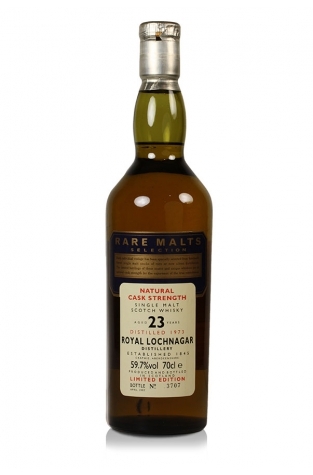 The Cardinal's Cellar has sourced this rare single malt Scotch whisky which is bottle number 3707.